I’m feeling very autumnal after spending a morning foraging for mushrooms in a forest in the Ripolles area of Catalunya, in the foothills of the Pyrenees. The Catalans are mushroom mad, it is fair to say. Go to any market in the region and you’ll see piles of ceps, chanterelles, saffron milk caps and a mindboggling array of other varieties at this time of year. 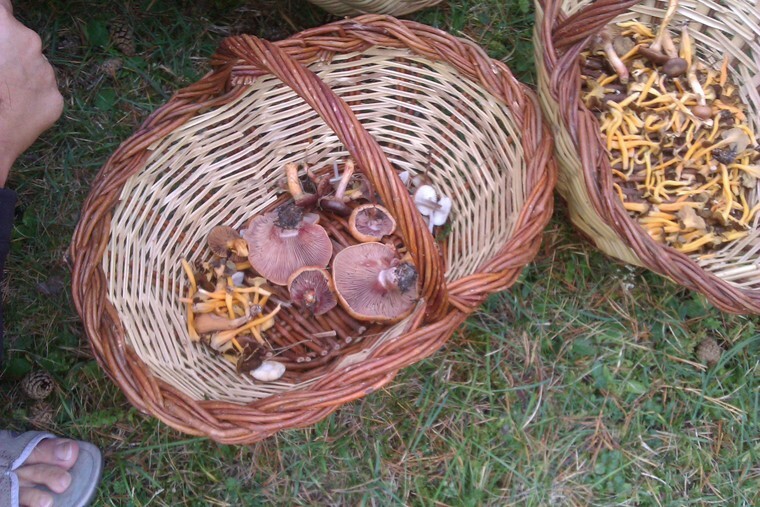 The Catalans never say they are going to pick, collect, gather or even forage for mushrooms. Oh no, they are always going hunting. And that is not ‘hunt’ as in looking for something, but as in pursue and capture – it’s two different verbs in both Catalan and Spanish. Owing to the lack of rain, it is however not exactly looking like a bumper year for mushrooms. That is my excuse for the rather paltry selection in my basket, although it undoubtedly had more to do with my lack of skill or any idea of what I was doing. But it was certainly fun. I really can’t explain why peering at the forest floor, brushing branches out of the way, shoud be so enjoyable; it’s just one of those mysteries in life I am happy to leave unsolved. I was on a hillside somewhere outside Gombren, a little village in a bucolic landscape eight miles from Ripoll, the main town in the area. Gombren may be tiny, but it does happen to have a rather good restaurant, Fonda Xesc. 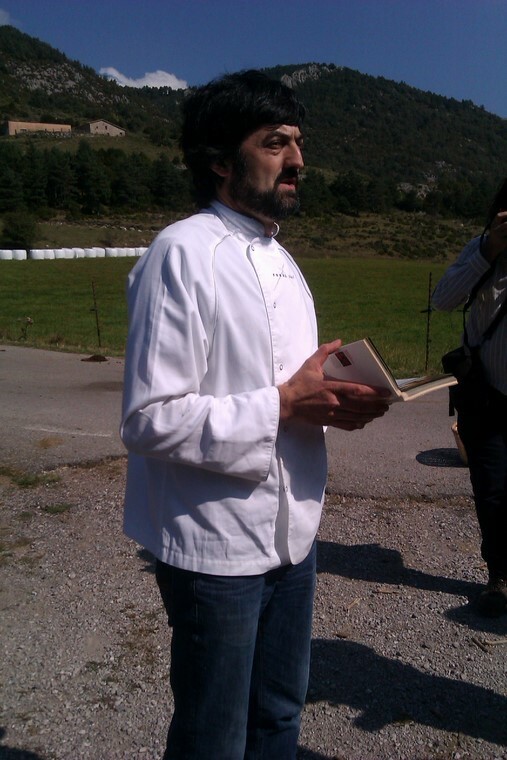 Housed in the village inn, which dates back to 1730, it is run by Xesc Rovira, who was awarded a Michelin star in 2009. Fortunately Xesc knows rather a lot about mushroom hunting, and after a coffee on the terrace outside the restaurant, he handed me a basket and we set off for the woods. Foraging about in the undergrowth, Xesc was soon finding some fine specimens. At first I couldn’t seem to see any at all, but gradually my eyes learned what to look for, and I started spotting the odd mushroom and pouncing on it with glee. Back at the restaurant, our baskets were emptied out in the kitchen and soon our mushrooms were sizzling away on the grill. I was even allowed to push them around a bit with a spatula. Me! In a Michelin-starred kitchen! Then the sous chef told me not to fiddle with them so much, just to leave them be. Oh well. I won’t give up the day job just yet. If I even had a day job to give up that is…. I need hardly say they were the best – and freshest – mushrooms I’ve ever tasted. 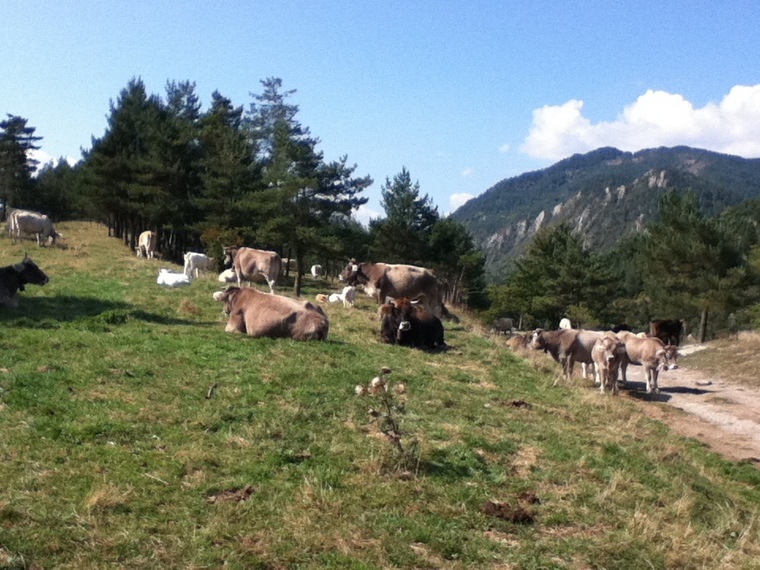 Have a look at Costa Brava Pirineu de Girona for more information and ideas about travelling in the region.